[ARCHIVED THREAD] - mk262 and ta31 acog 4x32 w/ a rra stainless 1:8 twist barrel...bdc? I was wondering if anyone had any info on how to compensate bdc ballistics of mk262 (black hills) 77 grain ammo. I'm shooting it in a rra 1:8 twist stainless 20" bareel. (The predator model rifle). I have a flattop receiver w/ an acog 4x32 optic on top of it. Amber chevron reticle. I zeroed at 100 yards, but am I gonna be low at 300 yards? I plan on using the bottom of the chevron (per instructions) when firing at 300 yards. I know the ta31 bdc is calibratd to m855 62 grain...but can I still use the bdc on it somehow? God didn't make all men equal, Sam Colt did. according to this link you should be 2'' low or less. where are you getting this stuff from for a $1 a shot? all my mil buddies day they cant get it...only if they "steal" it. which they will NOT be doing. The TA31 is calibrated for 55gr ammo out of a 20 inch rifle mounted on carry handle. The TA01NSN is calibrated for 62gr ammo out of a 14.5/16 inch carbine mounted on flattop. The difference in trajectory from bullet to bullet or barrel to barrel is usually less than the MOA thickness of the stadia lines. 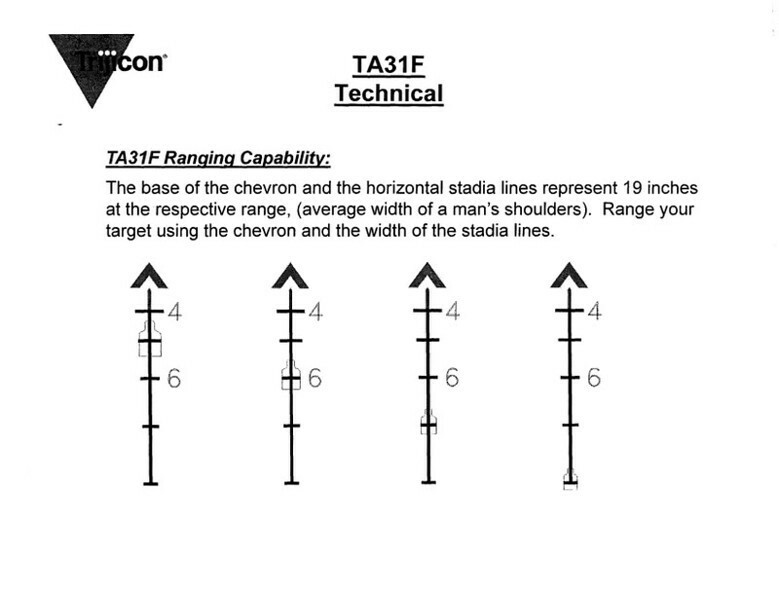 The lines are calibrated to meters not yards. Once I start shooting 300m and out I am just trying to bang a chest size metal plate with my TA31. ?i thought all of them were for 62gr. Where did you find the 55gr info? 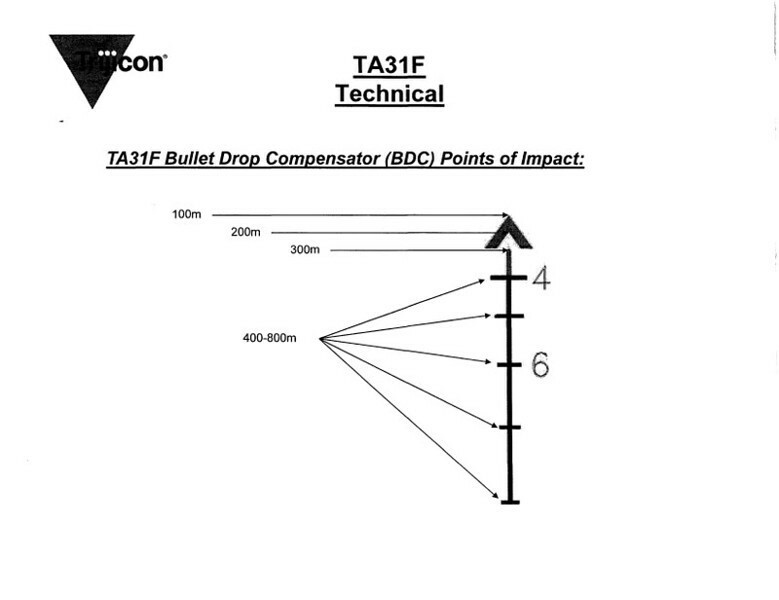 The TA31 is calibrated for 55gr ammo out of a 20 inch rifle mounted on carry handle. The TA01, TA11, & TA31 (.223) were designed for the 5.56mm, 20 inch barrel, 55 grain bullet, and M16/AR15 carry handle mount. The TA01B & TA11C(.308) were designed for the 7.62mm, 20 inch barrel, 168 grain bullet, and M16/AR15 carry handle mount. The TA01NSN was designed specifically for the US Special Operations Command SOPMOD M4 Carbine. To meet their requirements, the reticle bullet drop compensator and range finding stadia lines were based on the trajectory of the 62 grain bullet from a 14.5 inch barrel, flattop mount (Picatinny rail Mil.Std.1913). Is that info missing from their webpage? I own a TA31H (horseshoe reticle) BAC. The manual (for all 3.5x35 and 4x32 models) neglects to mention any bullet weight calibrations. So...then my TA31H (with M4 BDC) is also calibrated to use M855. I just looked into my scope and at the bottom was "TA31RCO-2"
My apologies to the OP. I find MK262 and the SS109 bullet has almost the same POI. maybe .5 off ? if that much! you should be very close . YOU ARE THE SAFETY !! !